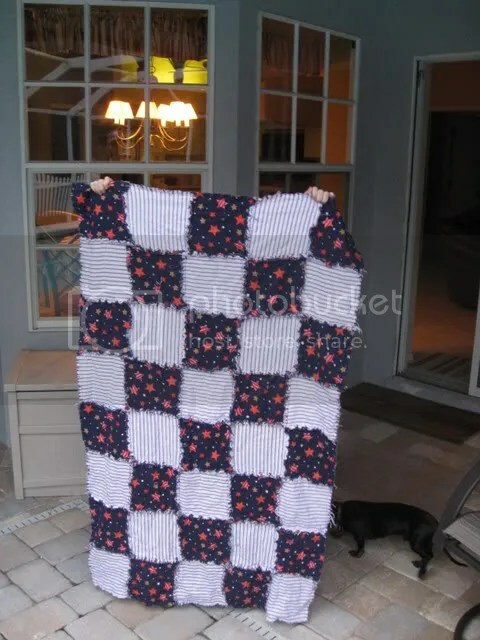 I have always been a little scared of tackling a quilt but I had an idea in my head so after thinking about it for a few months I decided to go for it. Yes, it sometimes takes me months to decide to do something but once I decided I finished in a weekend (thanks Tom for taking the kids to the beach so I could finish uninterrupted). 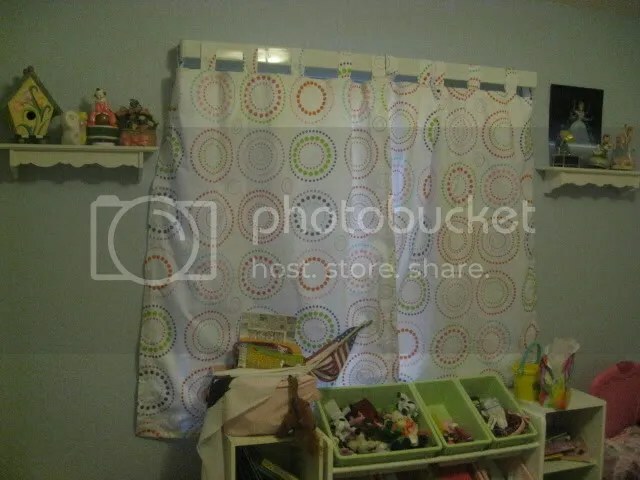 Megan wanted to update her room from the nursery, which I thought was fair since she was 7 years old. She picked a bed in a bag set from Target and that’s where we started. 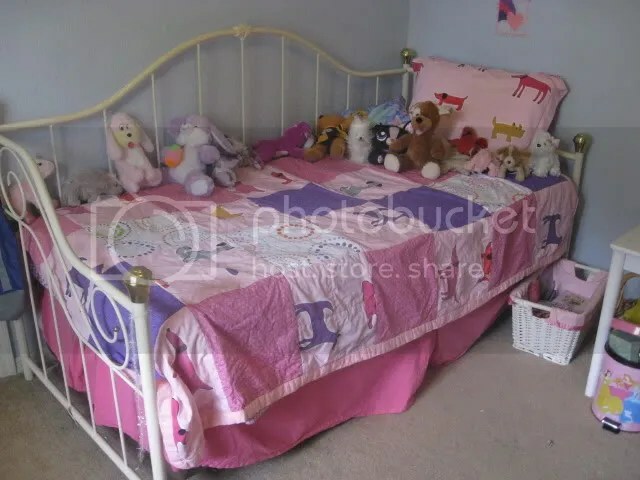 The problem was the comforter was so thick and hot it was not useful for a little girl’s bedroom in Florida. 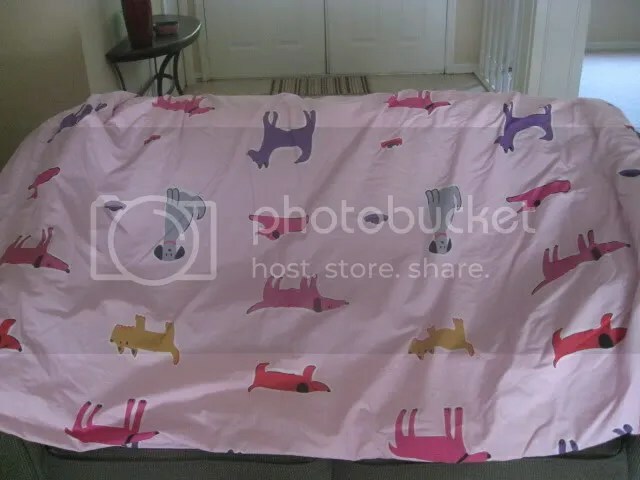 I tried to fold it down at the end of the daybed but it so bulky that didn’t work either. I decided if I cut it up I could make a quilt. But I was scared to make a quilt (see, that’s what took the months of thinking!). 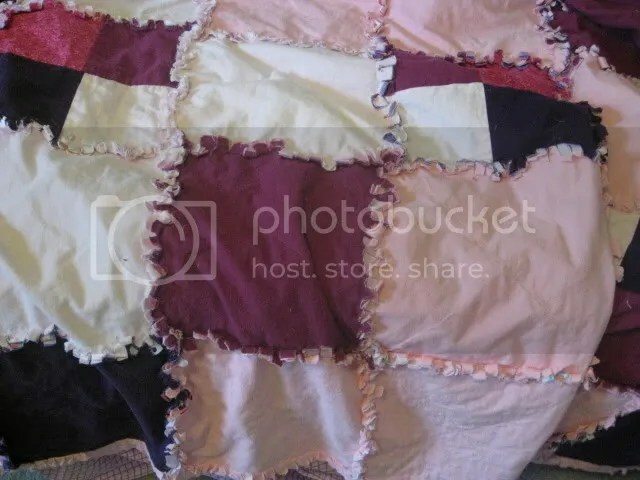 I decided to do a rag quilt. 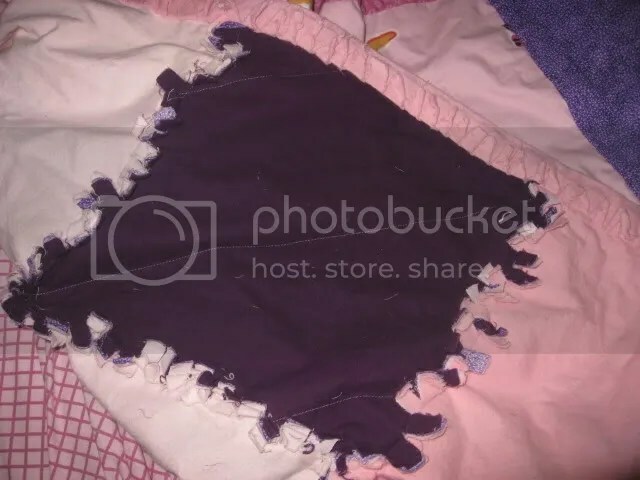 I had made lap rag quilts for the kid for Christmas and they are cute and cuddly without being to thick. Thanks Jacob and Scrappy for modeling it! I bought flannel for the back and started cutting squares 14 x 14 inches. I cut up the comforter, quilter’s cotton and the curtains Megan picked out to match that were too long for the front and flannel for the back. 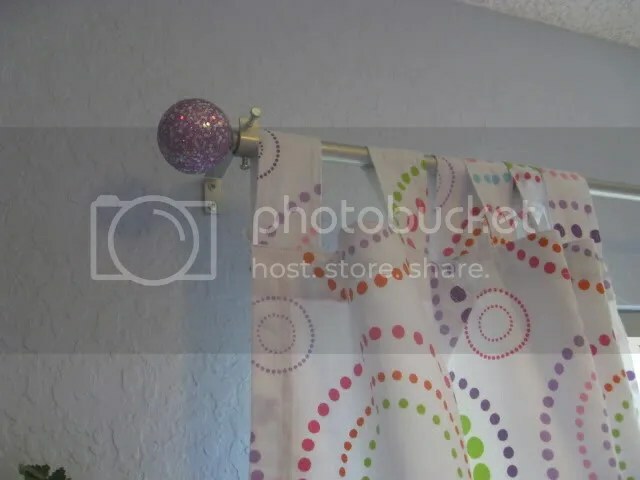 Oh, here are the curtains, cute right? I sewed black out fabric to the back and cut them to cafe length so we could put her little toy baskets under the window. The black out fabric is not blacking out! Megan’s favorite part: lavender sparkly finials. Found them at Lowes! I cut 35 squares for each side (the quilt is 7 by 5 squares for a twin size). Then I sewed the cotton side to the flannel side. I tried to vary the way I stitched them together: I did an x on some, a plus sign on others and lines running diagonal on the rest. It kept things interesting because I was getting a little frustrated at how long this project was taking (and I also went to JoAnn’s twice because I ran out of fabric). After I had all the squares ready, I just sewed them together to make lines of 5 squares across. 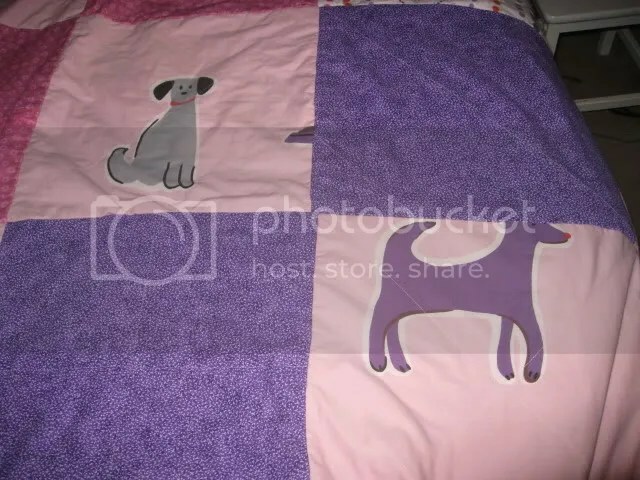 I sewed cotton side to cotton side so the raggy side would be on the flannel side. For the binding, I cut strips of flannel and sewed it around the cotton side and then flipped it around to the flannel side and stitched in the ditch all the way around. After all the sewing, I had to cut, cut, cut! I cut little slits all the way around the binding and seams on the flannel side. Then I washed it. Megan loves the finished project and I love that she can actually use it at night!